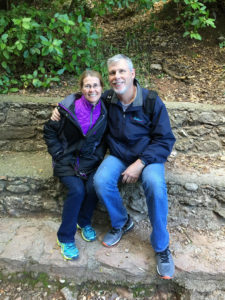 Long-time residents of Southern California, Mike and Tammy Nash were given the opportunity to move to the DFW area last July. As they settled in, having left their families and home church behind, they knew finding meaningful relationships was incredibly important. Upon our arrival to Fort Worth we knew that finding a church home was priority #1. We visited a number of fantastic churches and and then found Milestone through the website. From the statement of belief, ministry opportunities, worship, we were impressed. Tammy was looking for an opportunity to serve and we were both looking for relationships. Having left our family and friends, I knew loneliness could tarnish our adventure here in the Lone Star state. Tammy signed us up for Discovery 101 on our very first visit to Milestone, September 11, 2016. We loved the message; the worship and we especially appreciated the great coffee! But I needed more than what the main service offered, we were looking for relationships that mattered. We walked into the 101 class and were seated at a table with three other couples and our lovely table hosts. We started talking to another couple who recently moved from Minneapolis and discovered we actually knew the some of the same people. Before I knew it, we were all laughing together. Relationships, one minute in? As I sat there at my table, Pastor Jeff walked out to start the class. The very first thing I remember him saying is that Milestone is a church that values relationships. When he said the word relationships he looked directly at me! I knew at that very moment that we had found our church. There is no feeling that compares to knowing that you are right where God wants you to be. Now several months later, we find ourselves in a small group, I’ve found friends to golf with, and we’ve been having couples over to our house. All of that to say, in the last several months we have met more people at Milestone than we did in years living in California. Milestone lives out the principle of relationships. Tammy and I just had to be open to new people, new experiences and allow God to work in and through us in the process. He has, and we believe He will continue to do so. We are so proud to play a small part in Milestone’s journey. With a packed parking lot and hundreds of people in the building, walking into a church for the first time can be intimidating. It can be easy to feel lost in the crowd. But it all feels smaller when you take steps to meet people and build relationships! Mike and Tammy, thank you for sharing your story with us. We are so glad you are part of our family here at Milestone! to help people get connected. I love this story. Mike and Tammy are new friends to my wife and I we treasure their friendship. When I first heard how Mike was asking the Lord, in his heart, for relationships and how God answered him on their very first visit…well it confirmed for me once again the importance our Lord places on putting the solitary into family! So encouraged by this testimony. Amazing story! Never gets old hearing about people finding spiritual family.